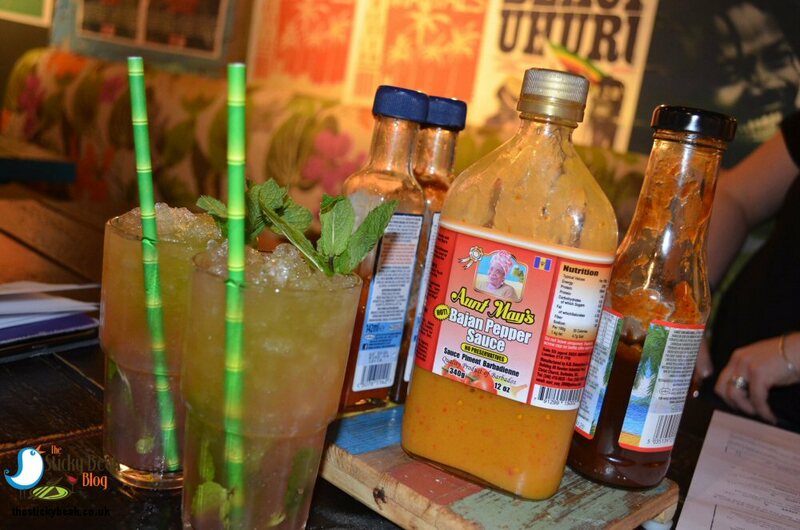 Getting our T'ing on at Turtle Bay with the new menu! The Man Bird and I love spicy food and we also love relaxed dining with an easy-flowing vibe. Well guess what? 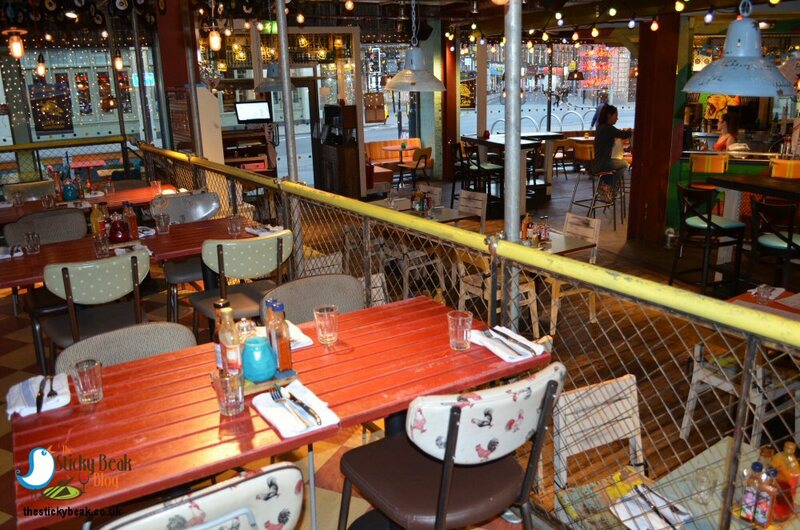 Turtle Bay has come up with our idea of heaven, called the Caribbean Social, and invited us along to sample the new dishes. 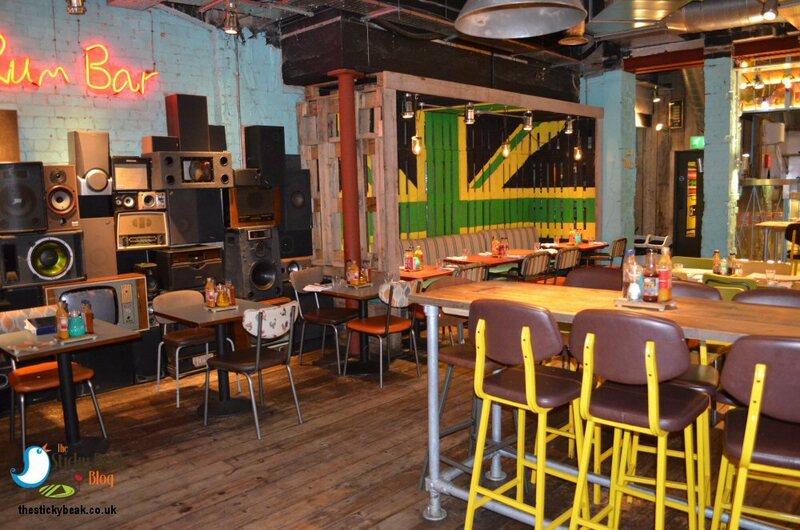 We’ve been to this fab, vibrant venue a few times in the past - the Marley Mojitos are to die for!- and we love the relaxed happy vibe the venue and its staff have. As usual we were greeted with a big smile and asked if we wanted to unwind at the bar, or go straight to our table; I was absolutely chewing my knuckles, so we headed to our table! A couple of Marley Mojitos were ordered and we had a quick squizz at the new style menu. There are some banging new items for you to try, and it’s a lot more flexible in the way you can eat too. From the “lunch and later” section I was sorely tempted by the Kingston Chicken Toastie (a Caribbean toastie sounds amazing, doesn’t it?) but decided that the Smoking Goat Burger was going to be my main course. His Nibs had got his eye on the Brown Chicken Stew; not a new dish but one he hadn’t tried before – much to his surprise! But before we could chow down on our mains we had to try the starters. I love the flexibility that this section of the menu gives you; there’s a whole raft of scrumminess to choose from and you can bundle them together for even better value: 3 for £15, 4 for £19, and 5 for £23. Even better, if there’s a group of you that don’t want the rigidity of a more traditional meal, you can do a mix-n-match of starters and sides and have a banquet of choice to graze on as you sip cocktails and unwind. Perfect. 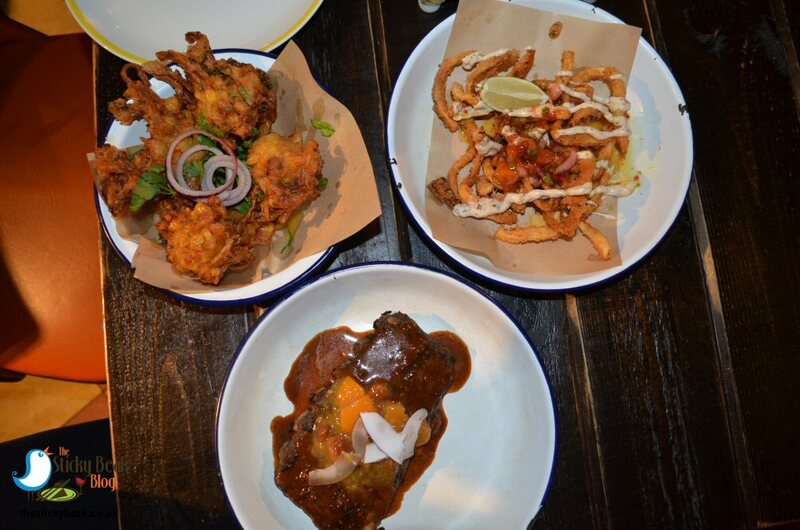 His Nibs and I chose Crispy Chilli Squid, Jerk glazed Pit Ribs, and Sweetcorn Fritters to kick our evening off with. 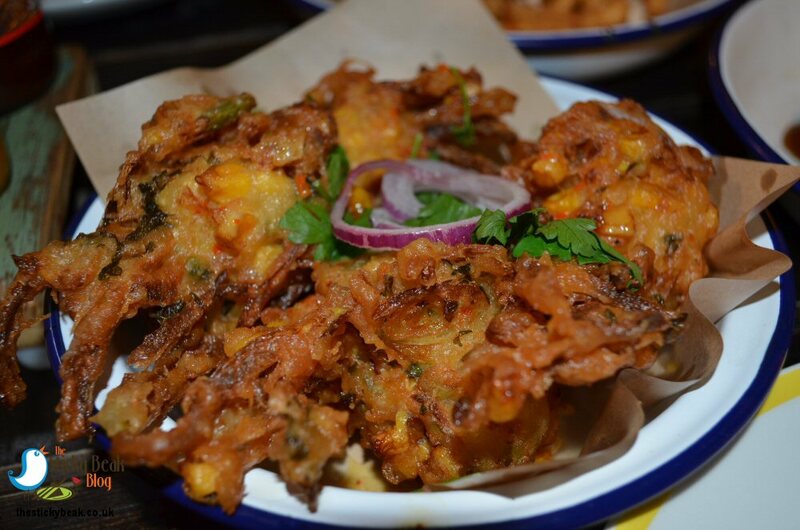 Personally, I could eat the Sweetcorn Fritters all day, every day; they are crispy on the outside and marvellously soft and comforting inside, with a real kick to them. I love them! The Jerk Glazed Pit Ribs didn’t disappoint either with their rich, spicy jerk glaze partnering the tender, tasty pork brilliantly. These morsels have a great sour Orange chutney to crown them, which pops nicely against the sweet but spicy jerk glaze; our taste buds were swaying with glee. The Chilli Squid completed a hat-trick of success for the starters with its tender strips and their uber-crunchy Panko coating. The heat factor gets ramped up courtesy of some Jerk Mayo and a wicked Mango mole. Our lovely server came and checked we were enjoying our food so far, and asked if she could get us any more drinks. The Boy Wonder was driving so he opted to have pink lemonade and I just hankered after a glass of Malbec, and ooh was it nice! I’ve already mentioned what we had for our main courses (Goat Burger and Brown Chicken Stew), so we just needed to decide on our sides; as with the starters you can bundle them together for better value: 2 for£5.40, 3 for £8, 4 for a tenner, and 5 for £12. We had 4 sides between us (His Nibs’ stew already comes with dumplings): Sweet Potato Fries, Green Herby Rice, Crispy Chickpeas, and Chilli Pineapple salad. There are loads of new sides on the menu, all of which are suitable for vegetarians and/or vegans. 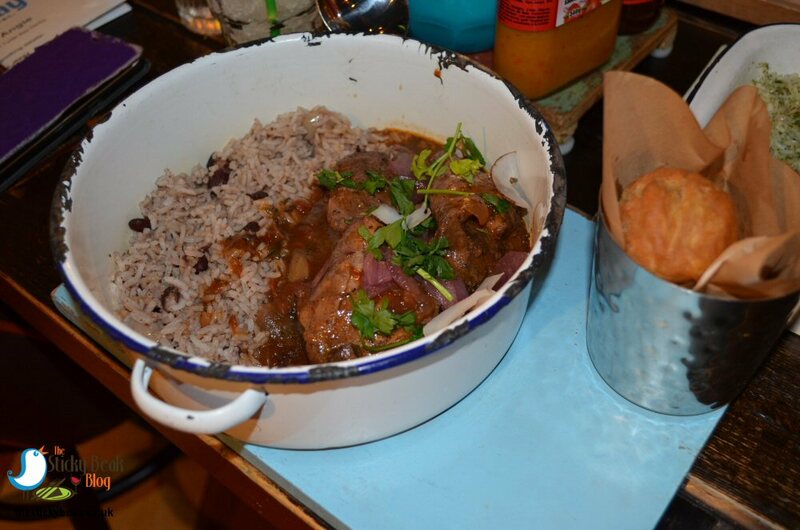 The Brown Chicken Stew is one of Turtle Bay’s one pot dishes, and as the lid was lifted the smell was just incredibly mouth-watering! The first thing he noticed was the size of the 4 pieces of chicken – they were huge! The chicken is cooked with Tomato, Allspice, Thyme, Scotch Bonnet chillies, and Ginger, and boy do you get the full effect of all the spices coming through in the gravy consistency sauce! All the meat was beautifully tender and moist, and came apart easily with the lightest pressure from the knife and fork. His Nibs used the dumplings to mop up all the juices. The Coconut rice ‘n’ Peas helped to tone down the heat factor a bit, the sweet note tempering the spice nicely. My Man was tucking into the Sweet Potato fries with gusto, so I nabbed one PDQ before they disappeared; nice and crisp on the outside, soft and sweet inside. 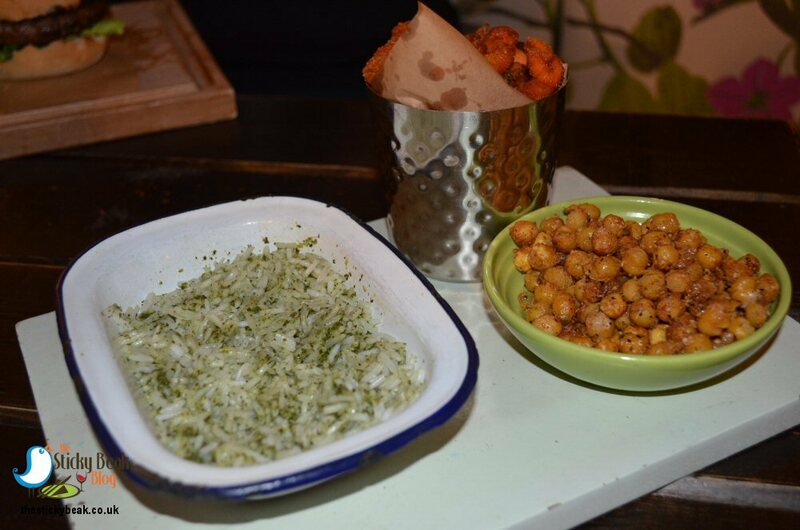 Both of us were bowled over by the Crispy Chickpeas; beautifully seasoned and yielding a pleasing crunch when bitten into, these delights would be perfect to nibble at with a cocktail after work. The Green Herby Rice was lovely and fluffy, with a gorgeous herby note; I was expecting roughly chopped fresh herbs, so was a bit surprised to see teeny tiny flecks more akin to dried herbs in it. It was really tasty, whatever version of herbs were in it. For me though, the absolute show stealer was the Chilli Pineapple salad. This was proper lively in the mouth, with the sweet fresh Pineapple dancing around and a sucker punch from the hot chilli note catching you unawares after a couple of seconds! Fresh Coriander had been roughly torn and sprinkled liberally over the fruit, giving a great taste that balanced the Chilli really well. 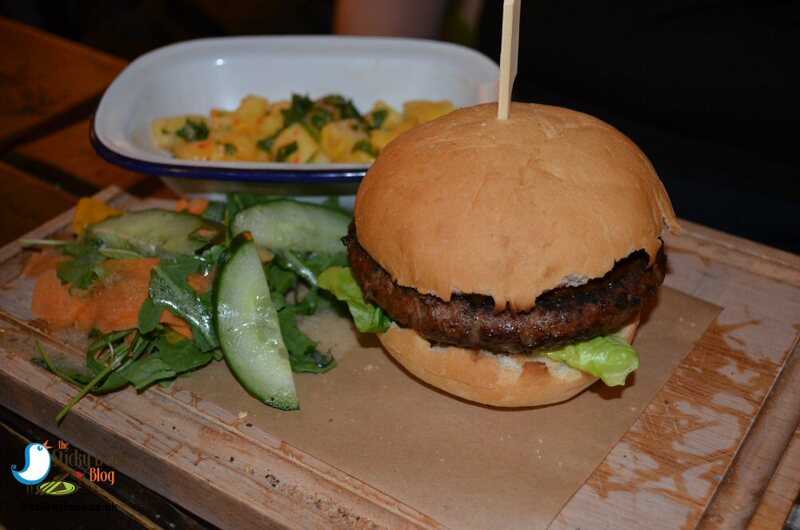 My Smoking Goat Burger (currently the only one available on the high street!) comes in a toasted bun with Rocket, Tomato, and Turtle Bay’s Hot Sauce. The heat of the sauce went superbly with the strong flavour of the gamey, musky Goat meat and the fresh Tomato and peppery Rocket gave a fab lift to it all on the palate. I loved the dense texture of the Goat meat too; I really felt as if I was chomping something substantial and had to give it a bit of respect. 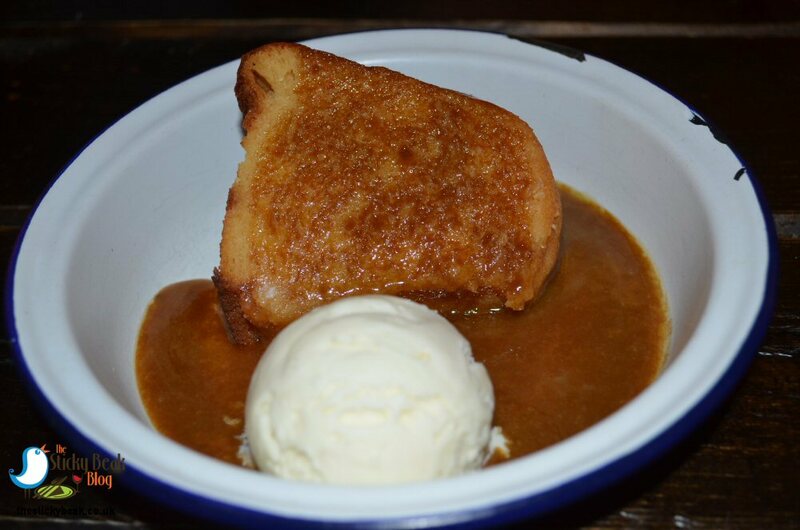 All that remained was to scoff pudding, not as easy as it sounds with our tummies amply filled thanks to the generous dishes that come from the Turtle Bay kitchens in Derby! The Man Bird chose one of the new desserts, Salted Caramel Brownie, but I stuck with my perennial fave – Caymanas Upside Down Rum Cake (it’s just stunning, I can never resist it!). 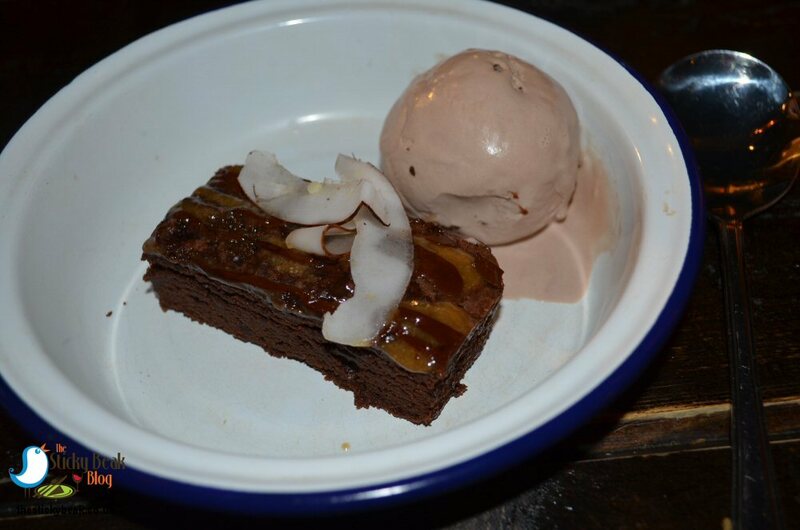 His Nibs does like a gooey Brownie and this one is bloomin’ ace! Really, really gooey and served warm to maximise this element and also to make the light Chocolate Ice Cream melt a little and ooze seductively over the sweet delight. Pleasingly, you get a distinct salt edge on the palate too. I’ve waxed lyrical about the marvel that is the Caymanas Upside Down Rum Cake on many occasions and each time I get the same little shiver of pleasure down my spine when I take that first bite. I love the fact that you can actually taste the rum in the cake and get that wonderful alcohol heat at the back of your throat. The Caramel sauce that accompanies the cake also has a punch of Rum in it, and they certainly don’t skimp on the amount of sauce in the dish either. As with His Nibs’ dessert, the cake is served warm and so the silky Vanilla Ice Cream melts and soaks in to the light texture of the sponge for an extra sensory hit. Hot Wings again to the Turtle Bay, Derby team, your service was spot on, and the food at its usual high standard. Both of us are impressed by the flexibility of the menu and the breadth of dishes that it offers. 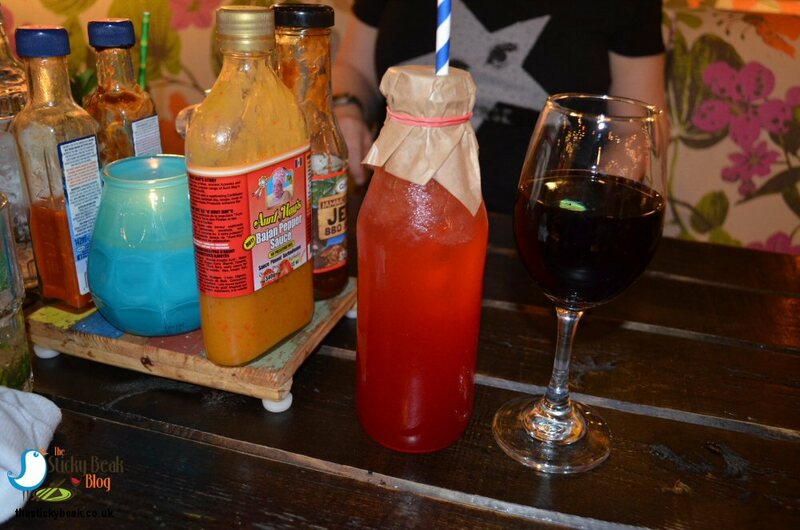 The drinks menu has upped its game too, with more alcohol free options than ever before and a selection of Beach Shooters so you can sample the beach shack rum cocktails as a taster.